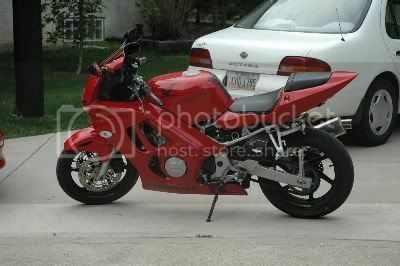 Up for sale is a 1997 CBR600 F3. The bike is in near perfect condition. The bike runs like new, free of any problems. Everything is fully operational. Very well maintained and looks nicely updated with the cosmetic additions. The bike has 18000 miles on it with a fresh oil change. New clutch was just installed. Recent front Dunlop D208 tire and new brakes. The bike needs nothing and is ready to go. I am including black leather icon cloves, an HJC helmet and a red/black Gericke leather jacket in the sale. Clear title in hand, never laid down! Bump for a beautiful bike!